When I saw Leviathan for a good deal, I bought it on a whim. I found the idea intriguing and my curiosity was stirred, but did it deliver? Yes and no. It is certainly a strong backbone for a larger story, but it gave me more details about machines and beasties less about the actual human beings in the story than I wanted. This book was a unique read, at least for me. I’ve never read steampunk or alternate history (OK, technically I have read the latter, but not an alternate version of a major point in history) and these were two main elements of the story. It’s set during WWI, but the powers pitted against each other are classified as Clankers, those who rely on machines, and Darwinists, those who rely on genetically modified animals. I have to admit that the Darwinists’ “beasties” made me a little uncomfortable, so even though the Darwinists are the Allies and thus basically who the U.S. would side with, I found myself more inclined to root for the Clankers. This combined with the fact that I also felt sympathetic towards Alek, one of the two main characters, who is the son of Archduke Ferdinand whose assassination essentially started the war. The second main character, Deryn, is a girl disguised as a boy who is able to earn her way into the British air service for the Darwinists. I did like her as well, but not as well as Alek for some reason. I think the main reason for this is that Alek undergoes a character arc in this book, whereas Deryn doesn’t really. I’ll have more to say on them later. Something I could have done without in this book was all the details about how the Clankers’ machines operated and how the Darwinists’ beasties functioned. I can understand why Westerfeld thought this material was imperative, but I felt a little bogged down by it at times. But even worse was how many action sequences there are. I like action when it moves the story forward, but I almost felt like the action made the story take long pauses instead. There would be shootouts and scenes of running away that lasted for more than a chapter and I really just wanted to move along and see how the characters were going to react to things happening outside of the action. I also apparently can’t follow action sequences very well, I’ve learned, and it doesn’t seem to matter who writes them. I always end up confused about who is where and what exactly they are doing and how they were able to do it. There were illustrations throughout the book as well, which helped me visualize everything being described! So I started this books, and I was waiting, waiting, waiting for these two to be “thrown together” and to watch a romance bloom! Well first off, they don’t meet until about the halfway point, but at that point they weren’t exactly fighting side by side yet. That comes later. And this destined to be together part? Well, towards the end of the book Deryn starts to feel a little funny around Alek, which she realizes means she kinds of like him, but there’s a problem, in that he still thinks she’s a boy. And even closer to the end she’s about to tell him when annoying Dr. Barlow barges in (OK, she’s not real annoying, but I didn’t love her either) and ruins the moment, and then shortly after that the book is over and HE STILL DOESN’T KNOW SHE’S A GIRL! He just thinks Deryn is Dylan, a good soldier and friend and dude. YOU’RE KILLING ME, WESTERFELD! OK, it’s probably not his fault that blurb ended up on the back of the book and gave me expectations he probably didn’t intend for to have. So I was a little disappointed by that. But again, it’s the start of a trilogy, so there’s more to come I’m sure. I just hope Deryn gets to tell him soon! Lastly about the human interactions, I wanted to mention that the couple of really vulnerable moments we did get with Alek and Deryn, with him sharing about his parents’ death and her almost telling him who she was, they were AWESOME and SPOT ON. If there had been so much more of that and so much less action and beastie talk and all that, this could have real potential to have another half or full star. I enjoyed a lot about this book ultimately, and hope in the next two installments to see more relationship developing (not all necessarily romantic) and less confusing, slow action. If you’ve read Leviathan, please share your thoughts! Or let me know: have you ever been deceived by a blurb? 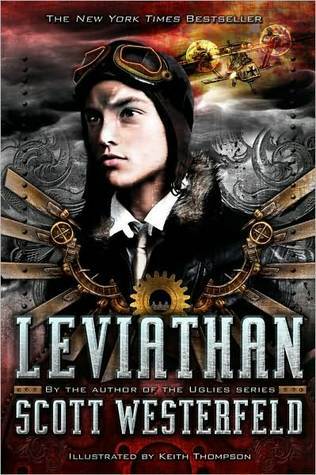 This entry was posted in Books, Reviews and tagged alternate history, books, reviews, scott westerfeld, steampunk, YA. Bookmark the permalink. I have not read Leviathan yet, but I really should. I mean, I love the idea of this alternate world where WWI is being fought with beasts/machines. Such a crazy cool premise! And I have a soft spot for girls who dress like boys to go fight. I actually did borrow this from my library once, but one look at the book and first page and I just didn’t have any desire to read it…at least, not right then. I’ve heard this is more MG than YA in many ways, so I’m waiting to be in the right mood. Also, the map is pretty neat, and that’s awesome that it’s made by the same person who did the Grisha maps. Yeah, I feel it really straddles the MG/YA line. The characters are like 15/16, so they’re not MG age, but it doesn’t read like typical YA… which I both liked and didn’t like at the same time, ha ha. It just feels younger for some reason that I couldn’t place my finger on exactly. But when you’re in the mood for something like that, definitely check it out! Yes, he did! I actually haven’t read it yet, so sadly I can’t compare the two for you, I also haven’t read any other steampunk so I can’t compare there either. For me, I saw a lot of the potential in the two main characters and look forward to reading more of them. Well I figured he figures out she’s a girl, I’m just hoping it’s early in the second book! And Afterworlds definitely sounds intriguing!